At the toy fair this year (2017), did you get a chance to look at everything? If you didn’t go, we’re going to tell you right now, you missed out on a lot of amazing toys that will be making their way to the market in the near future. While there are many neat toys, there were some that really stood out from the crowd for us for a variety of reasons. One of those toys was the WowWee Digiloom Machine – perhaps that’s because we could see our own kids playing with it as this is their type of thing? Either way, today, we are here to tell you what we have learned about the WowWee Digiloom Machine so far. Before we go into details about the Digiloom, we believe it would be a good idea to first introduce you to the company – WowWee. This is a privately owned company that is based on Hong Kong. They are well-known for focusing on “breakthrough consumer technologies.” You may know them for making the interactive balancing robot MiP or their biomorphic robot RoboSapien. They are a leading designer, marketer, developer and distributor of high-tech consumer entertainment products. This company has offices in Montreal, Hong Kong and San Diego. The WowWee Digiloom Machine is the type of machine your little girl will be asking for as soon as she sees it available on the shelf. This machine will help your little one create accessories, like bracelets, they can wear or give to their friends. The Wowwee Digiloom machine comes with a companion app that will help you design your own headband, bracelet or whatever else you choose to weave using the digiloom machine. Think about it – back when you were a kid, did you like making friendship bracelets? Perhaps you were given your own friendship bracelet that was handcrafted by your best friend? Friendship bracelets are given to prove that two people will be “BFF’s 4-ever.” Of course, in the past, friendship bracelets took a bit of time to make because we didn’t have machines available – machines, like the WowWee Digiloom that would do it for us. Friendship bracelets are something that have been appearing on the wrists of people of all walks of life, both young and old – think about it …it’s nothing new. So a machine like the Digiloom would definitely be helpful. 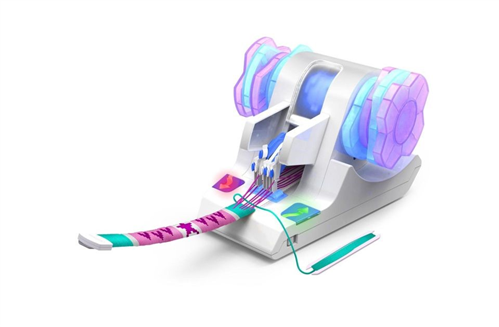 Not only will the Digiloom machine help you make a friendship bracelet, it will also help make headbands that you and your friends can wear in your hair. Making a friendship bracelet is a good project for a person of any age and there are so many different patterns that are available – the companion app that is available with the Digiloom machine has a variety of different patterns to choose from. There is a design available that is suitable for any skill level. Our favorite feature of the Digiloom would be the one that helps you make unique friendship bracelets. Not only are friendship bracelets beautiful and interesting, to the person who made it and for the friend who wears it, they carry a special meaning. create bracelets which they can wear or give to their friends. Click the image below & download NOW - Give your child the best start in life! © 2019 Just Toy Store.